After leaving the Bare Pool, we went home to clean up and take naps before dinner. 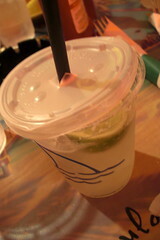 Naturally, Margaritaville is a great place for us; the atmosphere is casual and fun. The patio area is always a a prime place to sit because it offers a view of The Strip. Tonight the air was warm and simply perfect with a little breeze to cool off our warm skin. 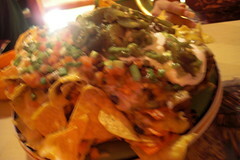 The nacho is something to order for an appetizers. Six people and we barely made a dent! I was having too much fun; I spilled my margarita all over myself and the waiter brought me another in a sippy cup...LOL!! Good thing the dry Vegas air dried my clothes right up..except that spot on my chest. Today was a great day and I couldn't have asked to spend it any other way than with good people, great food and thirst-quenching drinks. It looks like you had a good time.